I'm a notorious Sephora Points hoarder. I may toss out 100 points on a nice mascara sample or a small tube of a hydrating face mask, but dropping 500 points on a kit of minis has never melted my butter. That's because, quite frankly, none of the Sephora 500 point kits have impressed me over the past year. Until now. Sephora is currently offering the Marc Jacobs Blacquer and More kit for 500 points. It's all makeup, and it's all makeup I would use (no bronzers, no lipglosses, etc. ), so I jumped right on it. And if you have any interest in Marc Jacobs products, I suggest you do the same. Before I get too engrossed, please note that all of these products are deluxe sample sizes. They're generous samples, no doubt, but don't expect full-sized goodies in your box. First up, the eye products. There are two eyeliners in this kit: the Highliner Gel Eye Crayon in Blacquer and the Magic Marc'er Precision Pen Waterproof Eyeliner (squee, cute name!). The Highliner is, as the name suggests, a creamy gel formula. It absolutely glides on to my waterline and sets quickly, so if you're in to smoked liner, you'll have to work quickly with this one. The pigmentation and formula of this remind me so much of my beloved Milani Liquid Eyes liner, but the Marc Jacobs product is a twist-up. That's better with a super-creamy pencil like this because otherwise, they need sharpened constantly. I'll stick with my Milani because I don't wear pencil liner that often, but this is absolutely worth it for the more liner-enthused folks. The pen eyeliner is also fantastic. It has a long marker tip that's thin enough to make precise lines, firm enough to prevent wobbling, but soft enough that it doesn't scratch. This formula is also a rich, pigmented black. 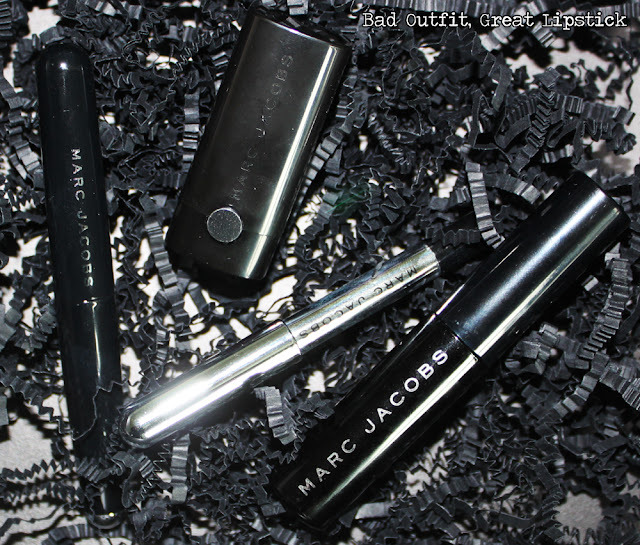 Unlike many liquid eyeliners, the Marc Jacobs Magic Marc'er has a distinctly glossy finish to it. I love my Wet n' Wild liquid eyeliner to bits, but it's matte...so this one tempts me. The mascara is the O!Mega Lash formula. I've tried it before; I kinda liked it then and I kinda like it now. It clumps like no tomorrow, and if you aren't careful, the ends of your lashes can look bent and spidery. However, it's a very rich black that provides plenty of volume, and I dig that. I've also experienced next to no fallout with this mascara. I'm not tempted to buy a full size tube because the formula is more wet than what I normally like, but trust and believe I'll use up my sample for nights on the town. 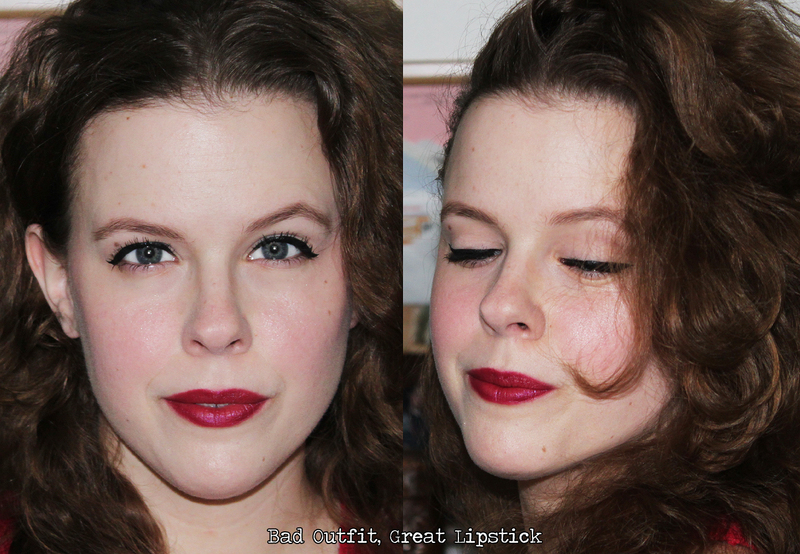 The only "meh" part of this kit, for me, is the Le Marc Lip Creme in Magenta. The color--a satiny purple with a hint of blue iridescence--is really gorgeous and will flatter a lot of skintones. The formula is nice as well: the lipstick applies opaquely and easily with one quick stroke. I did find this formula slightly drying, however, and the staying power wasn't up to par with other satin/matte lipstick formulations. Keep in mind, however, that I wear mostly satin/matte lipsticks and I like my rouge to wear like car paint, so my tastes may not match up to yours. The shiny black-and-metal tubes get smudged up easily, but that's a minor gripe. Overall, this is probably the best 500 point perk Sephora has released thus far. And as of this posting, it's still available on Sephora.com! I swatched the gel crayon in blacquer and was extremely impressed. It's terribly hard to draw finer lines though. I think the lipstick looks absolutely gorgeous on you! Oh, yeah, I don't use pencil liner for that--just for tightlining. I think you need a harder pencil if your goal is make sharp lines!